April wasn't as productive of a month as the past three have been, due to me now working full time (as many of you know)... but I'm still very happy with my finishes. :) Although, it's the first month I haven't finished a quilt... the streak is over :( I need to get on that for May. That bottom right picture is a block I made for Quilts for Boston - I'll share that in another post this week. For now... I'll keep cutting for my little mini quilt! More soon! Linking up with Fresh Sewing Day @ Lily's Quilts. Finished my April blocks for the Sisters' Ten BOM just in time for April to be over :) This block is called "Lady of the Lake," and it can be scrappy or not. Anything goes, really. They took a while to finish because of all those darn HSTs - but I got a lot of practice! With the other block, I got my triangles a bit mixed up - oh well. For this one, I went completely scrappy. Here's what I have so far, four months in! For the BOM layout, we're supposed to make 2 of each block, but I'm going to be changing the layout up a bit. I liked "Lady of the Lake" so much that I just HAD to make two! I frequently get alerted about blog posts and random things going on in the modern quilting blogosphere through Facebook, so I thought it fitting to make my own Quilty Habit Facebook page. If you'd like, you can "like" it (that sentence sounded weirder than I intended) - I'll be reposting things I find on Facebook (as described above), as well as my new blog posts, and quilts that I love found on other blogs (you can also see the little "f" pennant flag at the top of the right column of my blog, courtesy of the c.w. frosting design lab)! 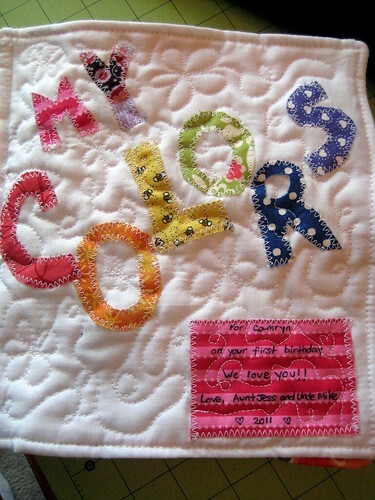 My guild's May challenge is to make a mini quilt (to swap), using an analogic compliment color scheme. We learned a lot from our March Color Class, thanks to our president and my good friend Jess. Now, instead of putting my skills to the test, I consulted (and spent about 15 minutes) playing with different color combinations on Color Scheme Designer 3 - a free tool (seriously, go try it, you'll spend at least 15 minutes there, too). The scheme I looked for is called something different on CSD: "accented analogic," which means that it's an array of three colors in a row on the color wheel, plus the one directly across. This analogic compliment feels very springy/summery to me, and luckily I've recently acquired some great stash additions, so I was able to mirror it pretty well in fabric selection. Meanwhile, I'll keep working on my April BOM blocks. Almost done and can't wait to share! However, yesterday I compressed a nerve (at least, that's my diagnosis) in my sewing/driving foot (of course - why couldn't it be the other foot?) so I literally can't sew. Haha. Hopefully a couple more days and it won't hurt anymore! There's nothing I love more than to make quilty/sewy things for my family and friends. So when we stayed in Maine a couple of weeks ago, and my sister-in-law was in the process of redesigning her family room, I volunteered to make her a quilted pillow and teach her how in the process (I assured her it was super easy) (because it totally is!). We all decided on a color scheme (green for their new carpet, brown for their couches, and yellow for the pop) and a design (Let's Eat Grandpa's Bloomin' Quilt-As-You-Go tutorial) and I was itching to get to work as we drove 11 hours back home. This pillow went together pretty quickly, but looks can be deceiving! I learned the hard way that each piece of fabric would quickly be covered up, and that I would go through about 2 bobbins. But the tutorial was very well done and I am dying to try it again soon, to compliment my own family room. Cheryl said she liked this fabric when we went shopping together, and I was lucky that it fit the color scheme just perfectly! I was doing SO well. Resisting the sales, resisting fabric I really want to add to my stash (Constellations, Micro Mod, AMH linens, Lucky Penny, stash builders in general that I have no control over buying)... but then I saw this AMH FQ bundle of voile from Westwood Acres. I. Can't. Even. I was hovering over the "buy" button before I could even think. 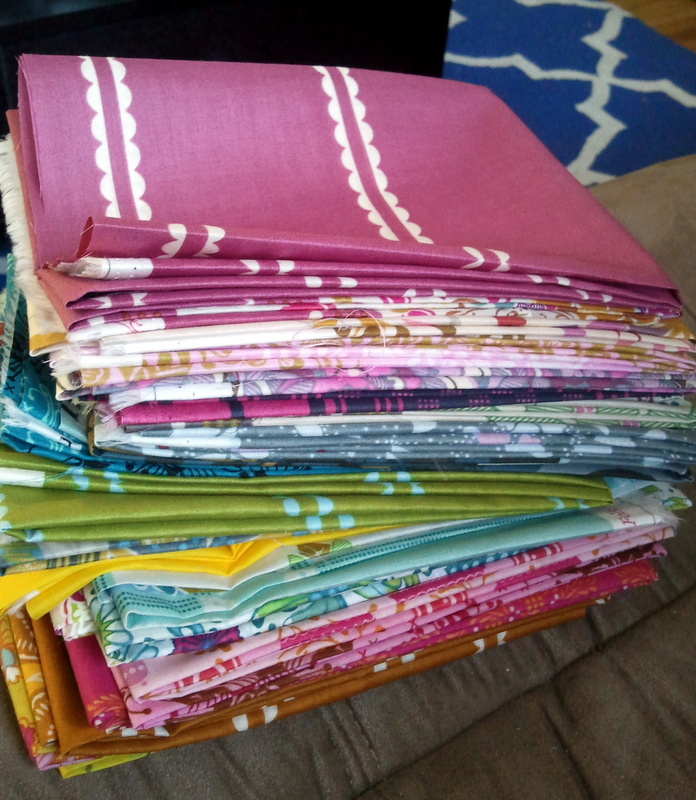 I don't know if I've mentioned this, but I'm literally gathering every AMH fabric I can (mostly half yards) (and eventually some solids) to start an improv-ish/sampler quilt. I have a Pinterest board of all my favorite blocks... and a healthy amount of them will be involved. It's going to be whimsical and beauteous (hopefully), much like this quilt from Maureen. How am I doing so far? :) Haha. I totally raided Sew, Mama, Sew no less than 3 times during their $6 a yard sale. They had everything I wanted! And now I have the voile. I'm thinking of doing voile just on the back... it would make for such a beautiful, soft backing. This might sound like a silly question, but can you use the voile and quilting cotton together on a quilt front? Will they sew together okay? Has anyone done that? I'd love to hear your thoughts! It's done! And it was my April goal!! And I finished it at the CJMQG retreat. Yay for finishes! And especially yay for finishes with mostly Anna Maria Horner triangles (with Amy Butler, Joel Dewberry, and solids thrown in for good measure). 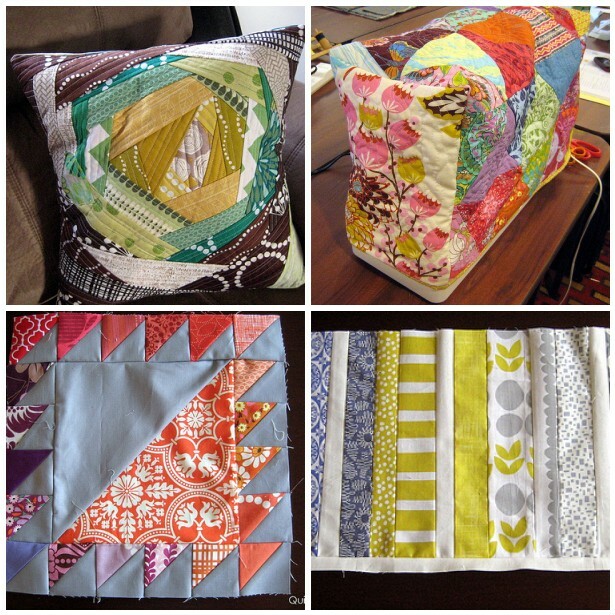 I used this quilted sewing machine cover tutorial from Sew Delicious. Baby's first retreat, and baby's first cover! I quilted in a wood grain pattern, blogged about here. It gives the whole thing a beautiful texture! I quilted in grey Connecting Threads. It was the first time I tried this technique - I'll surely be using it again soon. It's now keeping my sad, quiet sewing machine warm as I teach and lesson plan my days away. Which, by the way, I'm stoked about. Not so much the quiet sewing machine, though. At the retreat, I also finished a fabric baby book that I had to give to my niece (for her first birthday!) the very next day. Alas, I couldn't get very good pictures because it was nighttime, but here is is. You can see more similar ones at my tutorial post for this book, which I have updated now that I've made a second one. The retreat was a blast - I learned the magic of binding clips (they hold everything in, like Spanx) (it's true) and how to attach and use my walking foot. I also met several guild members from elsewhere in NJ (hi Diane - I know she reads!) and got lots of advice from everyone about quilting. It's always fun sewing with my friends. I'm itching to go to another! Linking up to Fabric Tuesday @ Quilt Story, crazy mom quilts, TGIFF, Link a Finish Friday @ Richard and Tanya Quilts. "Can ya quilt me a poncho?" Just one thing we've heard tonight at our CJMQG inaugural quilt retreat. Click over to the blog to read more. I'm live blogging from a quilt event for the first time! 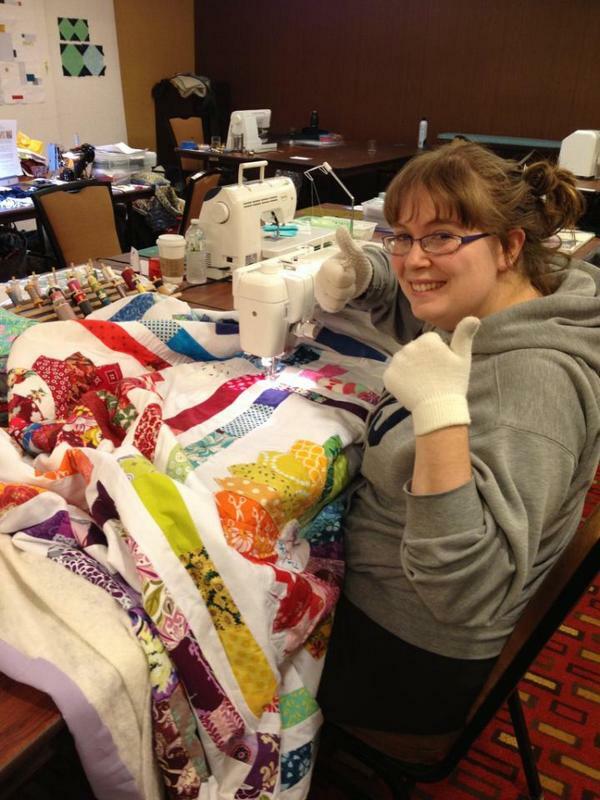 Also, the winner of the giveaway from 1 Choice 4 Quilting is Misty, who made this beautiful quilt with the Argyled QAL. Congrats Misty! She won a $25 gift card to the shop. 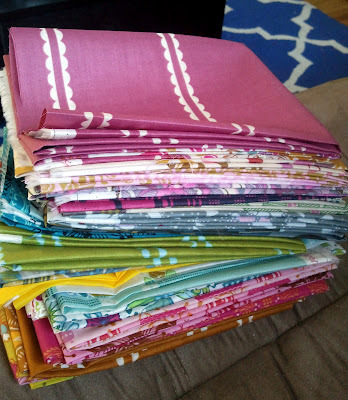 Go check out what Nicole has posted next: a Jelly Roll Jubilee and a giveaway! Husband: "We need a new, bigger pantry." Husband: "What if you use the old one for fabric? Yum. And the color of the cabinet totally brightens up my dining room, despite it being dark. Yay, even found a great place for a frame my sister gave me! Also, for layer cakes and FQ bundles I couldn't part, jelly rolls (top shelf), charm packs (blue blocks), neutral yardage, and AMH everything (second shelf), and backings, novelty, and holiday fabrics (bottom shelf). Look, the husband even put the Nutella in front. It's like he knew (PS: my current favorite chocolatey snack is pretzels dipped in Nutella - so you know what to try next time you are craving it!). I'm cataloging this as a "Project Color My Apartment" segment, under "storage." Both Mike and I are amazed at how much just two pantries changed our entire apartment. We've been hanging things and cleaning all weekend, so I should have more for this blog series soon! Husband: "Can I buy TVs by the yard?" This is going to be a busy month because I'm starting my new job, but I hope to get a few quilty things done. Also, this month, I'm running the CJMQG meeting (this Tuesday) and we have a weekend retreat coming up! I can't wait! MAIN GOAL: Finish the sewing machine cover for my new machine. This one is soooo doable. I've been FMQing the main part in a wood grain design, and I just started the sides. Then to put it all together! I'll be kicking myself if I don't finish it this month. 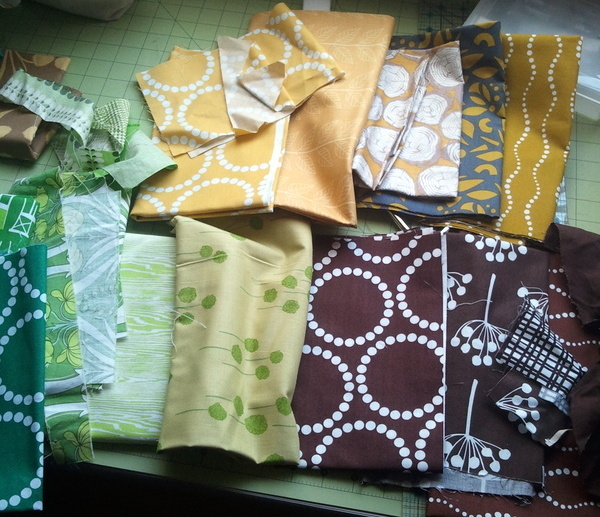 Make April blocks for the Sisters' Ten QAL - I don't want to get behind again! Start quilting the wedding quilt - the back is ready (here's a peek) and it's all basted! I started practicing some FMQ in preparation. Possible: Start sewing something for the classroom. I'm thinking a mini quilt of the world, in fabric, kind of like this map of the USA from Joy's Thoughts and Things. What do you have planned for April?